JustBats.com is giving you the chance to win a $25 Gift Card, and we're picking a NEW winner every week! All you have to do is send us a cool picture or video of you and your bat. All entries must be submitted via Facebook. BY ENTERING INTO THIS CONTEST YOU ACKNOWLEDGE AND AGREE TO THE FOLLOWING TERMS AND CONDITIONS. IF YOU DO NOT AGREE TO THESE TERMS DO NOT ENTER OR UPLOAD YOUR CONTEST SUBMISSION. 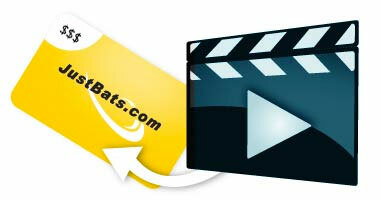 JUSTBATS.COM, PRO ATHLETE, INC. AND EACH OF THEIR AFFILIATES AND SUBSIDIARIES RESERVE THE RIGHT TO CHANGE THE TERMS AND CONDITIONS OF THESE CONTEST RULES. CONTEST SCHEDULE: Each weekly contest will run Monday through Sunday. Contest can be ended at anytime without notice. TO ENTER: Log in to your Facebook page, create a wall post, include #justbatsphotobomb in your caption and upload a photo or video of the bat. You must 18 years or older to have a valid submission. If you are under the age of 18 you must have a parent or guardian submit your photo or video. ELIGIBILITY: In order to be eligible, you must take a photo or video of your bat and upload the photo or video subject to the terms and conditions stated herein. We encourage you to provide any additional information to make your image stand out. This might include; the name of the bat, a link to the bat on Justbats.com, and/or a blurb about the photo you submitted. SELECTION OF WINNERS: A designated panel of judges from JustBats.com will evaluate each eligible submission based on the originality and creativity of each submission. The winners will be chosen weekly and their media will be posted at the JustBats Facebook Page . All winners are subject to verification, including without limitation, verification of eligibility and compliance with these rules. The decision of the judges will be final and binding in all matters; no contestant will have the right to challenge the decision and the judges will not engage in any conversation or explanation regarding their decision. NOTIFICATION OF WINNERS: Winners will be notified via Facebook. If attempted notification is returned undeliverable, if a Winner cannot be verified, or if a Winner is otherwise unable to accept the prize, the prize will be forfeited and may be awarded to an alternate Winner. Any submissions made by an individual under the age of 18 without parental or guardian consent will be removed. I irrevocably grant to JustBats.com, Pro Athlete, Inc., their agents, representatives, licensees, assigns and each of their affiliates and subsidiaries (collectively, “JustBats”) in perpetuity, for no additional consideration, permission to use the photographs or pictures (including but not limited to transparencies, negatives, prints, video, digital data, or other photographic images (“Photos”) submitted to JustBats an unlimited number of times in any manner JustBats deems fit in all media now known or hereafter devised, in whole or in part, or composite or distorted in character or form, without restriction as to changes or alterations, or reproductions thereof in color or otherwise, throughout the universe. I also consent to JustBats’ use of printed matter in conjunction therewith. 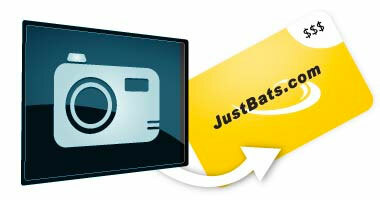 I understand that upon my submission and/or delivery of any Photos to JustBats, the Photos may be used by JustBats for any purpose whatsoever. I represent that I independently created the Photos I submitted to JustBats and/or that I have all rights, permissions (including, but not limited to, the rights to use the likenesses of people, if any, appearing in the Photos), consents and/or entitlements to use and license such Photos to JustBats. I agree to take any actions (including execution of documents) reasonably requested by JustBats to effect, perfect or evidence the foregoing representation and/or the license set forth herein. I hereby waive: (i) any right that I may have to inspect or approve the finished product, the advertising copy, or any printed matter that may be used in connection therewith or the use to which it may be applied; (ii) any rights to injunctive relief I may have in connection with this Release; and (iii) the right to revoke this Release. To the fullest extent allowed by law I agree to release, discharge, indemnify, defend and hold harmless JustBats, and all persons acting under JustBats permission or authority, including but not limited to employees, agents, sponsors, advertisers and contractors, from any liability, claim, damage, judgment, cost, loss, expense (including reasonable attorneys’ fees), by virtue of any publication or use of the Photos as previously described. I agree that in the event of a dispute arising out of the use of the Photos, my damages shall not exceed Fifty Dollars ($50.00) and in no instance shall I be entitled to seek an injunction against ’JustBats’ use of the Photos. If a court finds any provision of this Photo Release to be unreasonable or unenforceable in any respect, it is my intention and understanding that this Photo Release shall nonetheless be enforced to the maximum extent to which it is found by the court to be legally enforceable. This Photo Release shall be governed by applicable federal law and the laws of the State of Missouri, without reference to its choice of law rules. Nothing herein shall be interpreted as a waiver of ’JustBats’ rights to the Photos under federal and state common law and statutes (such as rights of public domain and fair use). This Photo Release constitutes the entire agreement between myself and JB with respect to the matters described herein, and supersedes any and all other agreements and communications, oral or written, between myself and JustBats with respect to such matters. This Photo Release may not be amended or supplemented except by a writing signed by JustBats specifically referencing this Photo Release.